Railroad Earth is returning to Colorado for a two night run at The Fillmore in Denver on Friday and Saturday night followed by two shows at Belly Up in Aspen. The band, whose first gig was nearly 15 years ago on the main stage at the Telluride Bluegrass Festival, has maintained a loyal following in Colorado, and it seems that every time they play in Colorado magic happens on stage. I spoke today with Railroad Earth’s Andy Goessling, who plays acoustic guitar, banjo, dobro, mandolin, lap steel, saxophones (sometimes two at once), flute, and pennywhistle about the evolution of the band, the Colorado music scene, and more. Below are excerpts from my interview. Railroad Earth’s first real gig was the main stage of the Telluride Bluegrass Festival in 2001. Though home base is New Jersey, it seems that your visits to Colorado are something of a homecoming. What is it like from the band’s perspective to come back to Colorado? It just seems like you’re going back to where everything is really happening, and every band now is passing through Colorado. One day I was looking through an entertainment magazine in Colorado, and I counted 200 venues on a Friday night. So coming to Colorado is coming to a real music community. The night you’re playing there are tons of people playing. It’s a really happening entertainment center. It gives you a lot of excitement to rise to the occasion. Everybody’s out on Friday night playing, and you’re just one of tons of live musicians that are out there putting a show on, so it’s just really cool feeling like you’re in a community. And the concert-goers, they might go to two or three shows in one night. They might have even already hit two shows before they came to yours, so it’s just a really cool feeling because they are really excited–seeing and absorbing the music. It seems like your Colorado fan base is among the strongest you have across the country–is that fair? Yeah, definitely. I’d say it’s the strongest audience. Well, like attracts like–with that many venues, with that much music to be seen, it just keeps on sucking in talent and people from 5-10 states away. At this gig I did yesterday I ran into someone I knew and they said, “Our daughter’s not here anymore, she moved out to Denver, and she’s looking forward to seeing you guys at the Fillmore.” It seems like there’s nobody out here anymore to go to shows–they’ve all moved to Denver! It’s actually not even a joke–I keep running into it every day, and conversely, you try to go play a gig here in New Jersey, and you run into five people who say “Oh, my friend just moved to Denver.” So, there’s a reason Denver’s got such huge crowds. You’ve got two shows coming up this weekend at The Fillmore, two more in Aspen at Belly Up, then you’ll be coming back and playing Red Rocks in September. Which types of shows excite you the most–the outdoor Red Rocks ones, or the indoor, more intimate shows like those you’ve done at the Ogden, Fillmore, or Boulder Theater? I don’t think it’s a matter of which is better or most exciting. A show at a place like the Boulder Theater is different because some songs are really hard to do at a place like Red Rocks. Some songs are better doing a huge venue like that, but sometimes a place like the Boulder Theater will pull out something that you haven’t done in a while or maybe a song with a little more complicated instrumentation. I might end up using a pennywhistle or a bass clarinet or something I wouldn’t otherwise use–you know, I might end up doing a song with instruments that sometimes just don’t translate at a big venue. So that’s always fun to open up a few more possibilities at smaller venues–possibilities that fans don’t get to see a lot. Do you and the rest of the band ever have the time to get out and take part in any outdoor adventures in between shows when you come visit Colorado? We try to do that everywhere. Really people get out and do whatever they can. We were in Flagstaff and we went to the Grand Canyon twice, and the same thing in Colorado; we’ve done shows in Aspen and Breckenridge and gone out hiking during the day, or some people go skiing (I’m not going to go skiing), but everyone does whatever they can before they show because it’s such a great opportunity. In the last several years, the band members have done a lot of side projects in addition to their music with Railroad Earth. You mentioned you played a gig yesterday, Todd has done solo shows, Andrew released a solo album in addition to having a child, etc. What are you all working on now and do you ever feel like you’re running out of time for the side projects? I’m doing a couple different things, and everyone is doing different stuff–it is always a challenge to juggle the schedule. Timmy produces records, Todd has done solo shows and he’s done reunions with his old band From Good Homes, John did a solo mandolin thing a while back and he still gets together with people and does bluegrass jams when he’s home. I’ve got a couple things going on–I’ve got a four-piece world music band called Sleeping Bee that we’ve been working hard to get out there–I released an album with that and am working on another one, and there are some youtube videos of it. I released a zither video, that’s a German instrument, and I’ve been doing solo stuff with that. And this gig I did yesterday, I got a call from Beppe Gambetta, who’s an Italian acoustic guitar player who tours all over the world, and I ended up coming down into New York City and sitting in with him for two days. He’s an amazing acoustic guitar player. But yeah, it’s a challenge just to fit it all in…but it all seems to work out. As I’ve seen the band play over the years, it seems that at each show the band is even tighter, more cohesive, and more polished–and that at each show the band seems to have gotten better and better. What are your thoughts on the evolution of Railroad Earth over the last 15 years? Just trying to keep a band together is a really hard thing, and yet it’s the best way to get musical evolution and tightness. So, the fact that you can have the same people and keep honing the songs is a real luxury. In a lot of situations, you just can’t keep a band together or you have to get new musicians all the time, so there’s really just no substitute for having the same people and being able to work on something like that–no matter whether it is a string quartet or a bluegrass band. I feel very lucky to be in a situation where it’s stable enough so that you can help the music like that. Like you’re saying, you can play the same tune for years, but you come back and realize the band is doing something new and that makes it fresh for everybody. Be sure to get your tickets to the upcoming Colorado Railroad Earth shows before they sell out, and while you’re at it, check out the recently released feature on PBS called Bluegrass Underground (a show that was done with Railroad Earth, Leftover Salmon, and Greensky Bluegrass deep in a cave in Tennessee) and the recent album that RRE recorded with Warren Haynes. 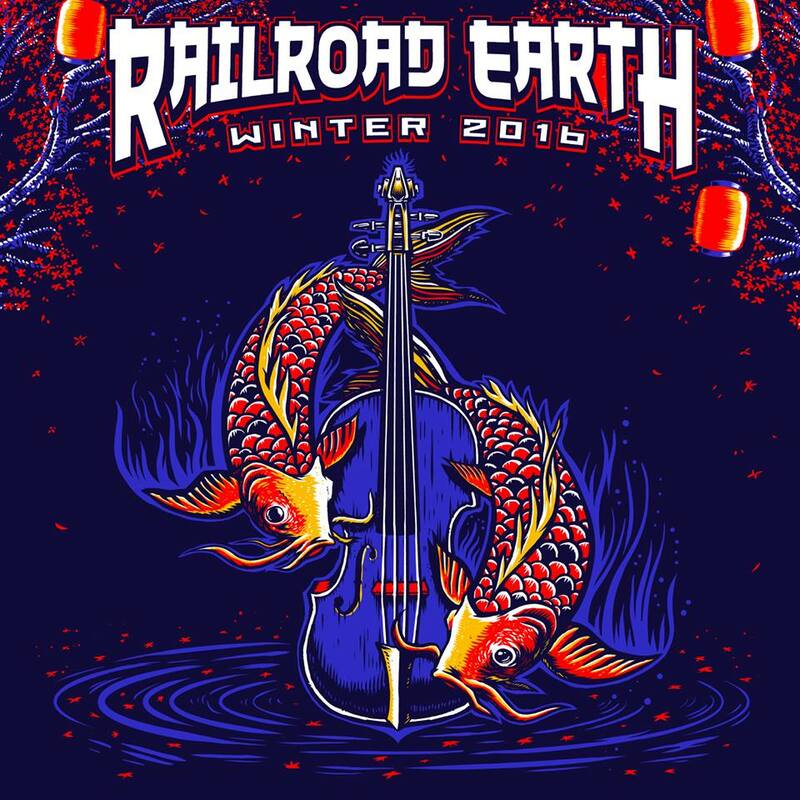 See you this weekend at Railroad Earth at the Fillmore!